Crews don't know where to put all the heavy snow that fell on Lawrence, Massachusetts, and froze over. 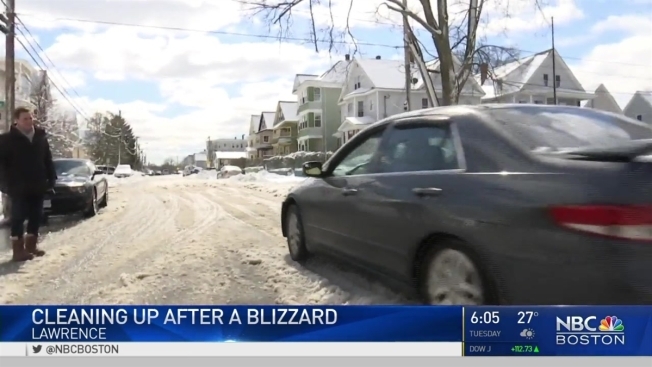 Cleanup continues around New England on Wednesday after a monster late-season storm delivered more than a foot of snow to many across the region, leaving tens of thousands still without power and an icy mess on roads and sidewalks. 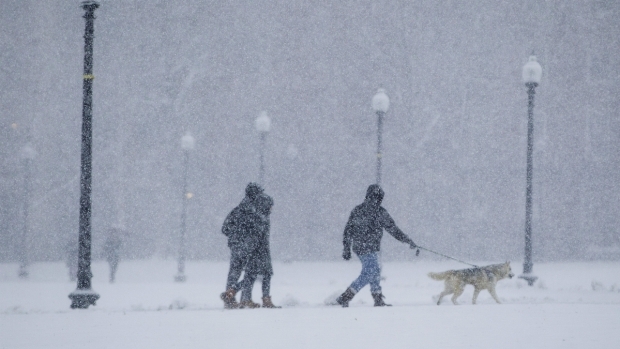 The nor'easter brought blizzard conditions by the time it reached Massachusetts, with near hurricane-force winds gusting to just over 70 mph on the coast. Although the snowfall prediction fell short in Boston, with just over 6 inches, some in Massachusetts saw up to 16 inches. The air-supported roof at the Hampshire Dome in Milford, New Hampshire collapsed Wednesday due to the weight of the wet, heavy snow that was on top of it. Meteorologists have warned that cleaning up this storm's snow may be difficult, since it's a very heavy, wet snow. That snow also brings with it the danger of roof collapses. 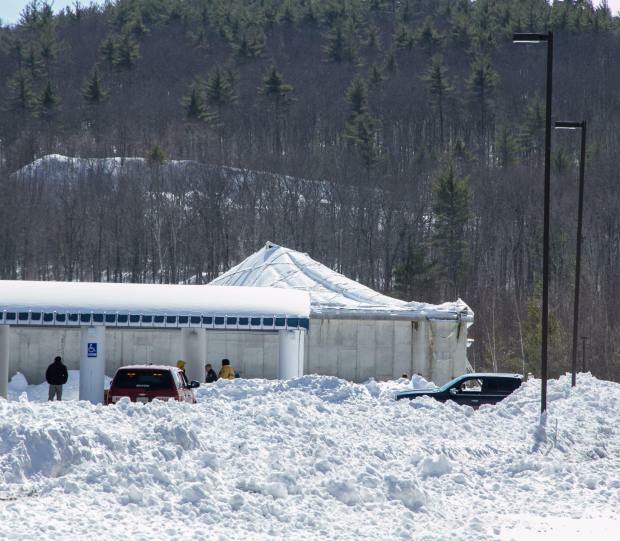 On Wednesday, the roof of the Hampshire Dome in Milford, New Hampshire - an indoor athletic facility - collapsed under the weight of the snow. No one was injured. The wet, heavy snow has frozen on many Boston streets, leaving walls of ice to block cars into spaces. Meanwhile, utility crews are busy restoring power to thousands. As of 3 p.m., fewer than 10,000 customers in Massachusetts were affected by power outages after high winds toppled wires and downed trees. In New Hampshire, about 16,000 were still without power, down from the storm's peak of 55,000. Although Boston's parking ban has been lifted, Mayor Marty Walsh decided to close the city's schools for a second day in a row because of Wednesday morning's icy conditions. However, youth centers are open. City officials are also reminding residents to clear hydrants for firefighters. In the city's South End, resident Liz McKenna said she hasn't even looked at her snow-covered car, and probably won't "until it all melts." Tuesday's storm was easily the biggest in an otherwise merciful winter that had mostly spared the region. While most people heeded the warnings to stay off the roads, police said a 16-year-old girl was killed when she lost control of her car on a snowy road and crashed into a tree in Gilford, New Hampshire. In East Hartford, Connecticut, an elderly man died after being struck by a snow plow truck. And, in Longmeadow, Massachusetts, a public works employee was killed after the snow plow he was driving was hit by an Amtrak plow train clearing tracks. Tuesday's nor'easter left behind an icy mess in Boston, forcing schools to close for another day as crews chip away at cleanup. The storm was on track to be one of the biggest on record for Burlington, Vermont, which got 25.6 inches of snow as of Wednesday morning, with another 2 to 5 inches due by the end of the day. About 70 miles to the northeast, Jay led the way with 34 inches.